A look at the companies demoing live at FinovateEurope on the 6 through 9 of March 2018 in London. Pick up your tickets today and save your spot. TESOBE’s Open Bank Project is the leading open source API solution for banks. Founder of the Open Bank Project, Redfern is a hacker at heart, always keen to explore emerging technologies. He is also a composer and enjoy creative collaborations and is based in Berlin, but from London. Chaib is a recognised Open Banking practitioner with more than 5 years of experience in the domain. As COO of TESOBE, he is in charge of sales, business development and marketing. Previously, Chaib was founder of SMSBridge. He is based in Berlin and from Algiers. Courtesy of help from TESOBE’s Open Bank Project, Santander is hosting its first hackathon this spring. The bank will leverage the Open Bank Project’s white-labeled sandbox technology and expertise to host the competition, themed Building Banking Your Way. Using a sandbox of emulated data, the hackathon aims to find innovative solutions to business challenges and tackle issues ranging from customer interaction, security, homeownership, and money management. Prizes will be awarded to participants who create submissions that “surprise, delight, and engage with users in a way that has never been done before” and the winning team will receive $14,000 (£10,000). Santander’s upcoming hackathon will take place from 16 through 18th March in Shoreditch. Simon Redfern, CEO of TESOBE / Open Bank Project, ​said that this hackathon comes at a particularly exciting time given the EU’s new open banking regulations. “A hackathon is a great way of gathering and focusing fresh perspectives and we’re excited to meet and support the up-and-coming innovators who have the vision, passion, and capability to rapidly deliver compelling fintech apps and services using Open Banking APIs,” Redfern added. The Open Bank Project has partnered with a number of global banks, including Societe Generale and The Royal Bank of Scotland, to help them organize and execute successful hackathons. With new PSD2 guidelines in place, banks may be more likely to open themselves to new opportunities and feel more pressure to create and adopt new, innovative services. Headquartered in Germany, the Open Bank Project was founded in 2005. 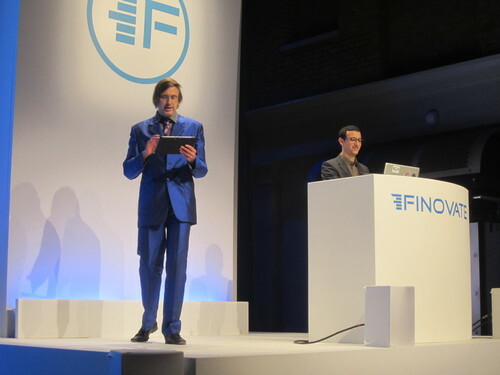 At FinovateSpring 2013, Redfern demonstrated a fun application of open banking– the world’s first singing bank. 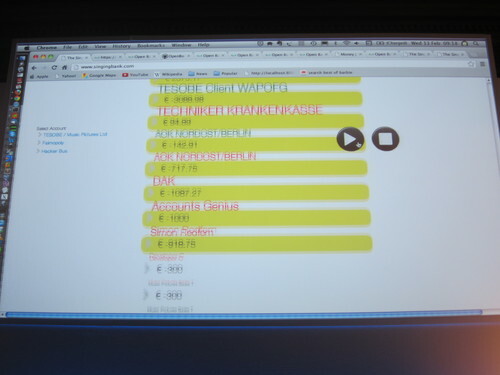 The point of the demo was not the singing bank itself, but rather was intended to showcase the ease of use of the Open Banking Project’s API. At FinovateEurope this March, TESOBE’s Open Bank Project will demo its newest technology from stage (register). Wealthfront Launches Homeownership Planning Tool. Kabbage to Serve Larger Businesses by Expanding Line of Credit to $250k. BlueVine Boosts Invoice Factoring Credit Line to $5 Million. TESOBE’s Open Bank Project Powering Santander’s First Hackathon. Come see TESOBE’s Open Bank Project at FinovateEurope in March. Playtech integrates Featurespace’s real-time gameplay fraud detection into IMS. ATB Financial joins SecureKey Concierge Authentication Service. Blackhawk Network partners with Casey’s General Stores to enable ‘cash customers’ with Amazon Cash. TIBCO and Singapore Polytechnic collaborate to address skills shortage for SMEs. Finabank selects Temenos for end-to-end technology. Finastra acquires FX e-trading platform, Olfa Soft SA. 4finance Group to deploy AML and KYC compliance solutions from FICO. Best of Show winner Finn.ai hires former Twitter executive Stephen Morse as new head of global strategic accounts. Nissan Motor Acceptance Corporation (NMAC) joins AutoGravity platform. eWise offers free access to Categorization-as-a-Service (CaaS) API. Mastercard to introduce contactless payments in Myanmar courtesy of partnership with Co-Operative Limited Bank (CB Bank). Michigan-based Marshall Community Credit Union hires Insuritas. Pirean’s Access: One wins Cloud Security Product of the Year at the 2017 Computing Cloud Excellence Awards. Microblink’s Photopay Expands to New European Markets. Daon and Experian talk about fighting fraud with biometric technology on CNBC’s Squawk Box. Let’s Talk Payments interviews Yodlee’s Terry McKeown on managing credit risk. Banking Exchange profiles alternative lender, PayActiv. The Silicon Review features Vantiv Head of Product for Integrated Payments, Moin Moinuddin. FintekNews sits down with Unison Co-CEOs Thomas Sponholtz and Jim Riccitelli to discuss shared real estate investing. Tesobe organizes cross-industry payments hackathon in Australia – Aug 11 thru 13th. CRN names Veridium on its list of 2017 Emerging Vendors. Total and Worldline Partner with Africa-based InTouch to help deploy Guichet Unique, a digital solution for retail networks. PYMNTS records 2015 payment-trend insights from multiple Finovate and FinDEVr alums. Arroweye featured in Credit Union Journal. Kantox brings free and automatic SWIFT messages to its clients. Dealstruck and Lendio release eBook. The Growing Business Awards names Zopa the Growing Business of the Year in the small business category. PYMNTS features Bento for Business. American Banker highlights how Tesobe’s Open Bank Project is working toward an API-based banking model. Markit and CLS unveil new streamlined process for cross-currency-swaps settlement. Let’s Talk Payments looks at Klarna and its unconventional approach to authentication. BioCatch adds Gadi Maier and Howard Edelstein to its board of directors. Comarch implements Field Service Management solution for receivables management specialist, the KRUK Group. MasterCard to deploy Mobile PayPass technology in Brazil, the company’s first NFC payment project in Latin America. Social Commerce Today takes a look at Azimo and the multi-billion dollar remittance market. Woopra, the customer analytics blog, profiles BillFloat. BBVA Compass picks Keynote’s DeviceAnywhere platform for mobile app testing. Kashoo announces “flash sale” for its iPad accounting app. Mobile Payments Today highlights the Pay Anyone app from Pageonce. Comarch invests PLN 1 million in a bid to strengthen its customer support services. Wired magazine features Acuity Systems’ Harlan Hutson talking about authentication and moving beyond the digital wallet. Efigence-implemented Alior Currency Exchange wins best innovation of the year award for 2012 from Polish Academy of Sciences and editors of Business Forum magazine. BBVA named Model Bank of the Year by Celent. ShopKeep POS wins Stevie Award for Best customer service. Fortune 100 company chooses Taulia to provide extensive invoicing capabilities. PaySimple launches starter promotional pricing to help newer companies grow and manage their businesses. TESOBE’s Open Bank Project organizes FinTech hackathon in London on the 19th of March at Level39. Doxo introduces provider online bill pay and view. PayPal expands relationship with Coinstar to add coins or dollars into or withdraw money from their PayPal accounts. Sharing Money On Facebook Just Got Easier: Should Banks And PayPal Be Worried? Thanks to everyone who came and helped make this year’s FinovateEurope the biggest yet. We will continue to add to this list throughout the next few weeks as new coverage is published. If we are missing press coverage or if you would like to add to the list, please contact julie@finovate.com with the link. This post is a part of our live coverage of FinovateEurope 2013. The OBP Transparency/Social Finance application is for organisations that want to practice wider transparency and/or generate a real time dialogue around their finances. The OBP App Store allows vendors to showcase and consumers to find and rank apps.